Ryabushkin made a name for himself in the history of Russian art as a talented master of his­torical genre-painting and a sensitive portrayer of the peasant way of life. He was born in the vil­lage of Stanichnaya Sloboda in Tambov Guber­nia. His father and elder brother were icon- painters, and the young Ryabushkin helped them in their work. The boy was orphaned at the age of fourteen, and remained with his elder brother who had by then taken up his father’s profession. Chance had a hand in Ryabushkin’s becoming an artist: while staying at Stanichnaya Sloboda, A. Preobrazhensky, a student at the Moscow School of Art, Sculpture and Architec­ture, noticed Ryabushkin’s talent. He took the boy with him to Moscow, enrolled him at the School of Art, and thereafter played a very ac­tive part in his life. The first works which Ryabushkin completed at the School of Art—The Pirates’ Attack, The Carnival Procession, A Summer Evening in the Country (1881, RUSSIAN MUSEUM, SAINT PETERSBURG) and others—revealed his interest in subjects connected with life in the Russian countryside. His most independent work of this period was his Peasant Wedding in Tambov Gubernia (1880, TRETYAKOV GALLERY, MOSCOW). This painting al­ready shows signs of the artist’s individual traits: his sensitive power of observation, his restraint and tenderness in conveying feelings, and his good-natured, indulgent irony. Ryabushkin did not complete his course at the Moscow School of Art. He went to St. Pe­tersburg after the death of his teacher Vasily Pe- rov and entered the Academy of Arts in 1882. He was greatly aided in his professional training by his teacher there, Pavel Chistyakov. Rya­bushkin’s picturesque study The Model (1887, Academy of Arts Research Museum) was given to the Academy as one of the best examples of pupils’ work. During these years Ryabushkin worked on subjects from the Bible, classical mythology and Roman history, in accordance with the Academy’s programme. The teachers at the Academy observed the young artist’s boldness and innovatoriness, his ability to achieve realism, the persuasiveness of his compositions and the naturalness of his characters. At this time, Ryabushkin also amused himself by doing illustrations for the popular magazines World Illustration and Niva. Ryabushkin chose a religious theme—The Removal from the Cross (1890, TRETYAKOV GALLERY, MOSCOW)—for his di­ploma work at the Academy. During his work on it, however, he cooled towards the original sketch which had been approved by the Council of the Academy, and, unafraid of the conse­quences, painted a completely new composition in the month before the work was due to be sub­mitted. This breaking of the rules led to his being denied the first-class gold medal. Didvino, which belonged to his close friend V. Belyaev. Here he had a studio and small house built to his own design, where he lived quietly and almost uninterruptedly, engrossed in mu­sic and painting. His closest advisers and friends, and the severest critics of his work were the peasants, to whose weddings, chris­tenings and family celebrations he was always being invited. 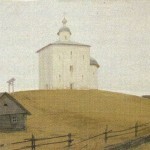 Ryabushkin owed his best works to the countryside, whose inexhaustible wealth of material constantly nourished his art. In 1891 he exhibited one of his works—Await­ing the Newly-weds in Novgorod Gubernia (1891, RUSSIAN MUSEUM, SAINT PETERSBURG)—for the first time at a Peredvizhniki Exhibition. According to the reminiscences of friends, this painting was inspired by Rya- bushkin’s impressions after attending a peasant wedding. It depicts the poignant moment when j the wedding guests, friends, relations and j match-makers are sitting in silence, awaiting the return of the newly-weds. Ryabushkin conveys I various shades of human feelings with great sim­plicity and restraint. He takes pleasure in his characters, whose moral integrity and dignity are close to his heart. The directness of style and , the vitality of the characters make this a typical product of the 1890s. In 1893 Ryabushkin painted the work Tsar Mikhail Fyodorovich in Session with Boyars (TRETYAKOV GALLERY, MOSCOW). In it he conveys with delicate but biting irony the air of boredom and formal self- importance which prevailed at such ‘sessions’. It is as though dummies in boyar clothing are dis­cussing affairs of state, their faces indifferent and apathetic. Here, for the first time, the artist uses a completely new, unusual colour-scheme. Whereas before his main concern was to achieve an exact likeness of his model, in this painting he set himself another, no less important task—to reveal ‘the spirit of history’ through the overall colour-structure of the painting. During the 1890s Ryabushkin completed a good many drawings and water-colours com­missioned for various albums and publications, and also made studies for the proposed re­decoration of St. Sophia’s Cathedral in Novgo­rod. His finest historical canvas of this decade was the painting Moscow Street in the Seven­teenth Century (1896, RUSSIAN MUSEUM, SAINT PETERSBURG). Choosing an everyday scene from life in Mos­cow of the seventeenth century, Ryabushkin recreated here a page from Russia’s distant past, bringing to life a typical corner of old Moscow, with its low stone and wooden buildings and its impassable mud. 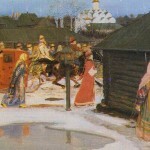 People lift high the hems of their clothing; a young woman in red, with a white scarf, carefully picks her way along a timbered footway; a boyar sits astride a black horse; a pauper seated in front of an icon is begging for alms… The artist had witnessed many such scenes in provincial Russian towns, and was therefore able to achieve remarkable vividness and naturalness in his portrayal. The landscape plays an important role in this work. The cold autumnal day, the dark clouds and the thinning foliage on the trees all lend a melancholy note to the atmosphere. The artist’s attitude to his subject is sensitive, good-natured and slightly ironic. Yet at the same time he ad­mires the primitiveness, the naive simplicity, the attractiveness and colourfulness of this way of life. For the painting’s decorative effect Rya­bushkin drew on the traditions of Russian icons and frescoes. He is not striving for an illusory portrayal of objects. His style of painting is dis­tinguished by its density, vivid decorativeness and localised patches of colour. This style was his own creative discovery, the result of his own interpretation of the problems of historical- genre art. Ryabushkin’s interest in the seventeenth cen­tury led him to plan a series of historical por­traits depicting representatives of the various social strata of that period. Only one portrait, however, was realised—The Merchant’s Fami­ly (1897, RUSSIAN MUSEUM, SAINT PETERSBURG). It is remarkable for the sta­tic quality of its composition and the im­mobility of the characters, who are neither caricatured nor idealised. Dissatisfied with his first attempt, and striv­ing to achieve more unity in the artistic inter­pretation of the piece, Ryabushkin reworked it, strengthening its humanistic basis and mak­ing the images of the girls more attractive and lively. In 1899 Ryabushkin completed one of his fa­vourite paintings, Seventeenth-Century Russian Women in Church (TRETYAKOV GALLERY, MOSCOW). Displaying a rare sense of decorativeness, Ryabushkin created an in­tegrated colour ensemble from the gaily-coloured clothes and the brightly painted interior of the church. With its flowing, sing-song rhythm, rich colours and lucid harmony, the painting is reminiscent of an old, melodic song. Its refined elegance recalls the ancient Yaroslavl frescoes, or old enamel-work and miniatures. Both this painting and The Merchant’s Family were awarded honorary diplomas at the International Exhibition in Paris. In 1901 Ryabushkin painted one of his best works, A Wedding Procession in Moscow (TRETYAKOV GALLERY, MOSCOW), which again evokes Moscow in the far-off sev­enteenth century. The noisy, brightly-coloured procession is moving swiftly along a street. Against the background of a dark-grey shed, we see the well-dressed figure of an unhappy young girl who is trying to remove herself as far as pos­sible from the splendid, gay festivities. The artist has left much unsaid, leaving it to the spectator to interpret the painting in his own way. The landscape is portrayed with particular subtlety —it is still and pensive, brushed by the last rays of the setting spring sun. In places the canvas has scarcely been touched by the artist’s brush, cer­tain details have not been elaborated, and Rya­bushkin himself considered the painting in­complete; yet for all this, it is an integrated work, full of emotional expressiveness. In the last years of his life Ryabushkin illus­trated many Russian epic tales, and also paint­ed pictures on village themes, such as Going to the Well (1898), In a Village (1902, private col­lection), Young Man Joins a Round Dance (1902, TRETYAKOV GALLERY, MOSCOW), In a Village. 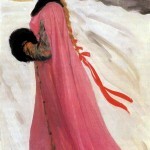 Going to Liturgy (1903, TRETYAKOV GALLERY, MOSCOW). His attitude to contemporary village life was reflected in one of his later works, Tea Drinking (1903, Moscow, private collection), in which his former poetisation of life in the Russian countryside was no longer in evi­dence. In its psychological depth, the work may be likened only to Korovin’s Village Meet­ing. In the last years of his life Ryabushkin was ser­iously ill with tuberculosis. In 1903 he went to Switzerland on the advice of his doctors, but sadly his health did not improve. 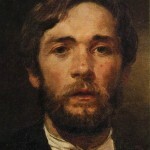 He returned to Russia and died on 10 May 1904 in his studio at Didvino, surrounded by his friends. Russian art lost a great, original and truly national artist.